But there’s an external political chaos brewing in the background, Cleo gets pregnant by a martial-arts loving deadbeat, and the family’s patriarch flakes off and never comes home after a business trip to Quebec. Suddenly there’s a political riot while Cleo is shopping for a crib, and all emotional hell breaks loose. The last third of the film is an engrossing, unforgettable revelation, and the water that once merely dripped or washed away dirt is now swelling (literal ocean waves) and washing away regret and grief, simultaneously threatening and bringing loved ones closer. The quietly thrilling beach sequence involving Cleo and her young charges is one of the most beautifully shot enthralling pieces of emotional suspense ever captured on film. Yet, oddly, the viewer can only feel at a distance, passively watching the intimate explosions, wishing we could learn as much about the characters as the director Cuaron seems to be telling us about himself. “Behold, my childhood nanny and flawed saint!” he proudly shows us. “Look, that old sci-fi movie Marooned I saw as a kid in this big old Spanish gothic movie theater in the city is what made me want to make Gravity!” he winks. It’s this type of hyperbole mixed with personal minutiae that leaves Roma straining to be loved…from a distance, through a perfectly framed lens showcasing a beautifully framed shot that drips…flows…moves, and occasionally overwhelms. I want to love. 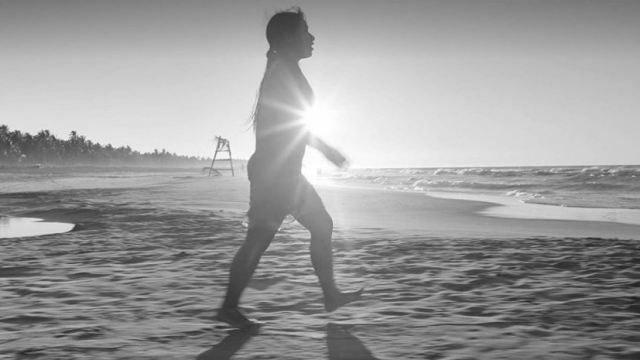 This entry was posted in Art, Art-house Cinema, Inspiration, Movie Reviews, Movies and tagged Alfonso Cuaron, Autobiographical, Childhood Memories, Cinematography, Family Drama, Mexico, Mexico City, Netflix, Roma, The 1970's, Tracking Shots, Yalitza Aparicio. Arti – I hadn’t noticed anyone else mention the water motif in the few snippets I glanced at before watching the review…but others have to be talking about it, right? It wasn’t subtle…at least I didn’t think so. I absolutely loved the water dripping from the drying clothes when Cleo and Pepe laid on the roof “playing dead.” I also thought the foreshadowing re: the baby was very heavy-handed, too. But I honestly enjoy a little heavy-handed foreshadowing. Great review David, though I am not sharing the debit aspects you speak of. I count this as a flat out Felliniesque masterpiece, beautifully acted and filmed and with a captivating and poignant grasp of a period when gender relations and social status took center stage. It is epic yet intimate and poetic. Sam – moments from Roma keep percolating in my mind a week later…but I still have the same issues with it I had initially…yet those are minor issues when compared to all of its wonders. With that being said…it’s shaping up to be a strange year end for me…Lean on Pete might actually be in the lead for film of the year…though If Beale Street Could Talk still needs to be experienced before I render any Top Ten. Yes you must see Beale Street indeed!